The recent ‘deportation’ from Lagos of some citizens of Anambra ruffled many feathers around the country especially those of the deportees’ kinsmen. 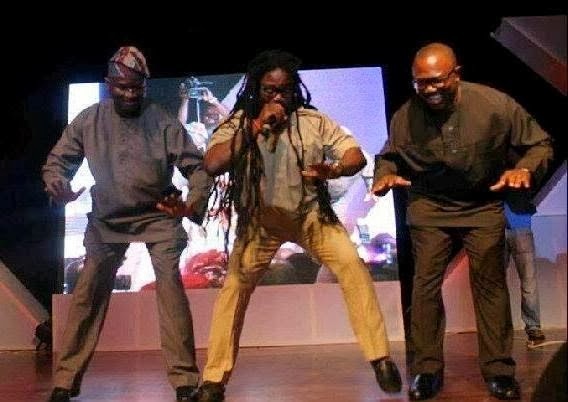 However, it seems that the saga has been forgotten and even forgiven as Governor Fashola of Lagos State and Governor Obi of Anambra State can be seen in this photo practicing ‘galala’ dance with musician, Daddy Showkey. The duo were both crowned with the prestigious award of Silverbird Man of the Year, organised by the Silverbird Group on Sunday night,the 2nd of March, 2014 at the Ekohotels & Suites in Lagos, Nigeria.